Please select a size. UK 5 - In StockUK 5.5 - In StockUK 6 - In StockUK 7 - Email me when back in stock UK 8 - Email me when back in stock UK 9 - Low Stock Please select a size. 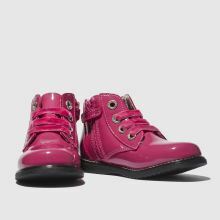 Pretty and pink, they'll be ahead of the trends this season wearing the kids' Camille boot from Lelli Kelly. Arriving with a hot pink patent leather upper, velvety pink laces compliment for a sweet look while a sturdy sole finishes perfectly.